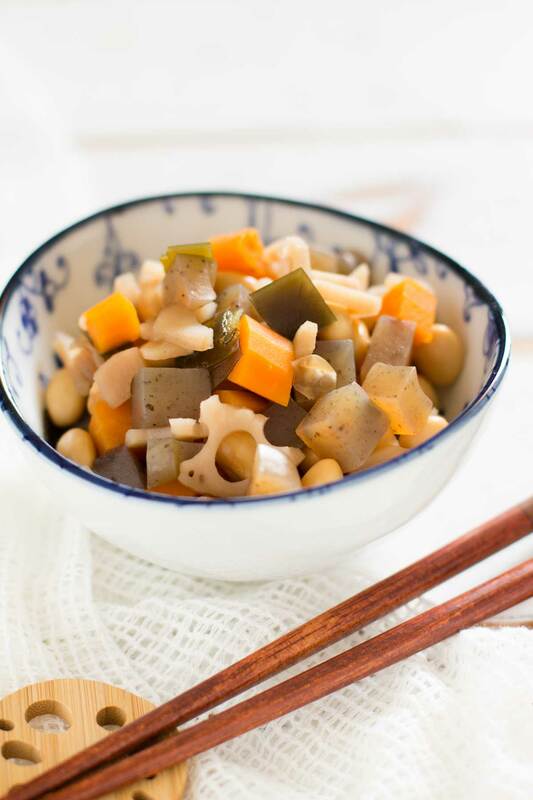 Gomoku Mame is a Japanese classic soy bean dish that we always stock in the fridge as a ready to eat food. Ready to eat foods stocked in fridge are called “Jyobisai” in Japanese. They are cooked in a batch and stored in the fridge so they are always ready to eat. 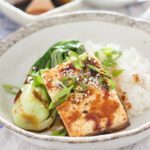 It is great for Bento too when you want to add an extra different little side dish. 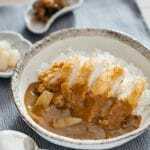 Japanese meals traditionally consist of a bowl of rice, a soup dish, and three side dishes. This style of eating along with using a variety of seasonal fresh foods, nutritious, and well balanced diet was registered as a UNESCO intangible cultural heritage in 2013. Having two to three dishes every meal is a lot of cooking. There are side dishes that Japanese people cook in a batch and keep them in the fridge ready to eat always. 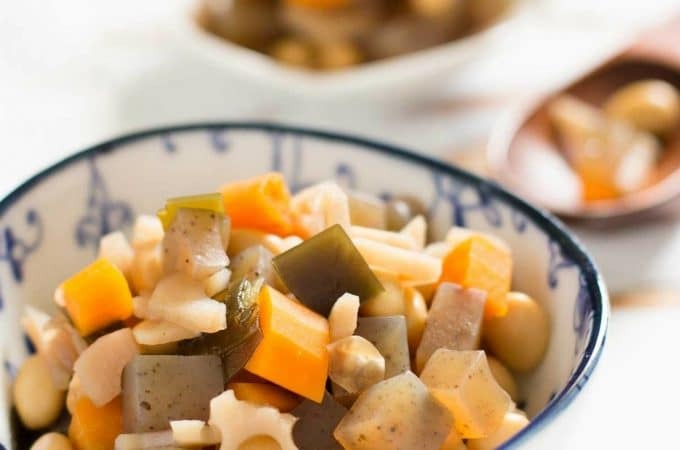 This Gomoku Mame is one of those side dishes that Japanese people always have in the fridge. One of Japanese people’s healthy diet secrets is a well balanced diet by eating a variety of food. 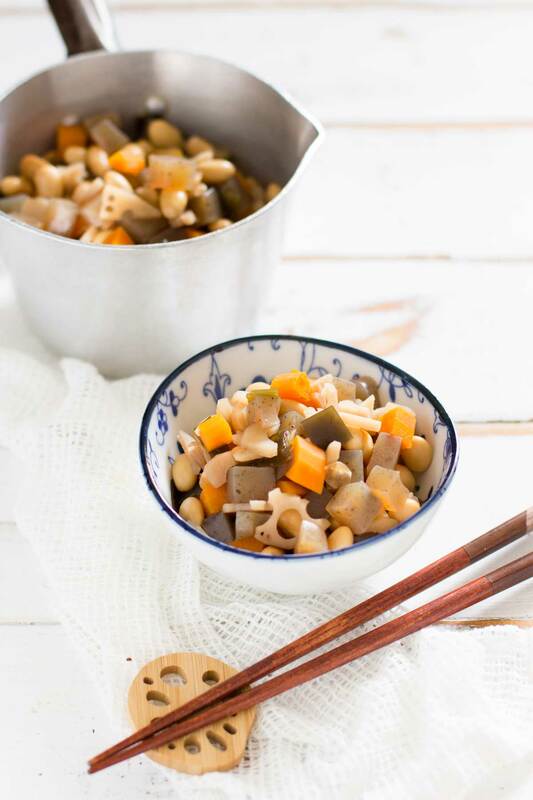 ‘Gomoku’ means five ingredients and ‘mame’ means beans. 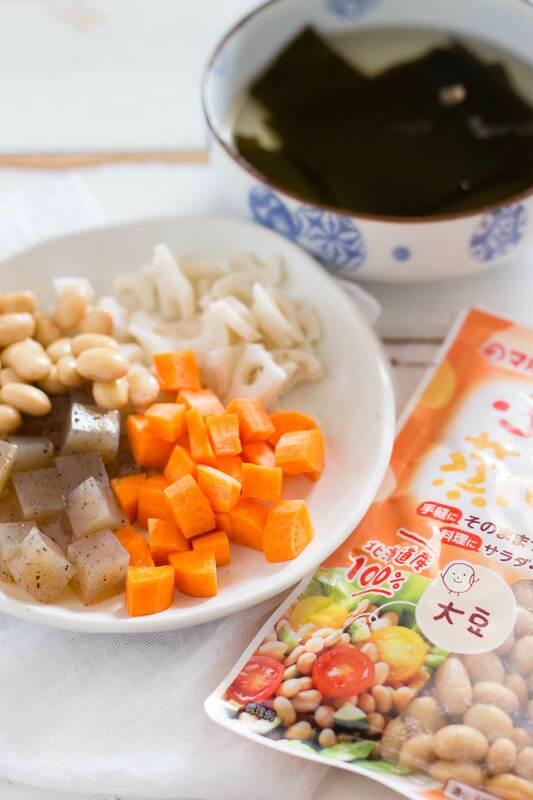 Gomoku mame consists of 5 ingredients including beans, usually we use soy beans. Other ingredients are carrots, kelp, lotus roots, and konnyaku (konjac). You can replace any of those ingredients with others such as Hijiki, Shiitake mushrooms, or burdock. Last weekend, I visited a local Japanese grocery store and I found a packets of ready to use soybeans that were on sale so I bought two packets. I wanted to use Hijiki instead of Konbu (Kelp) but I was told that Hijiki is a prohibited item to import into Australia. I think it is due to the level of Inorganic arsenic. Luckily, I had Konbu (kelp) stock at home in my pantry so I used Konbu. Japanese people consume a lot of seaweed compared to other nations and it is a well known fact among Japanese women that seaweed is good for your hair and skin health. Konjac is also a popular diet food among Japanese women as it contains a very little amount of calories. Konjac is a perennial plant of the genus Amorphophallus that grows in Asian countries. Konjac is known as Konnyaku in Japan and often used in cooking. Konnyaku has no distinctive taste, grey in colour, and is a firm, bouncy rubbery texture. Konnyaku is the popular choice of diet food in Japan because of its high fiber and nearly zero calorie content. 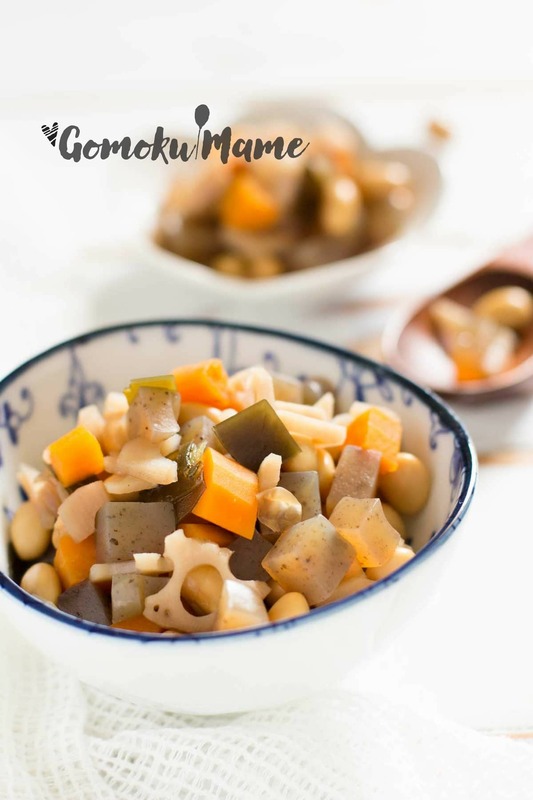 Gomoku Mame is a nutritiously well balanced ready to eat dish that you may want to keep it in your fridge too! Soak the Konbu in a bowl of water for 30minutes and cut into small size squares. Dice the carrot and Konjac small. Cut the renkon to small sizes. Boil water in a pot and add dashi powder. Add soy sauce, mirin, and sugar in the pot. Add all the other ingredients in the pot and simmer for about 15 - 20 minutes. 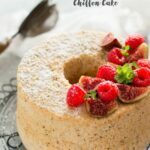 Cool it down and refrigerate to allow the flavour to be absorbed. Serve as a side dish in a small bowl. If you can not get a ready to use soy beans, you can soak 1 cup (about 200g) of dry soybean with 3 cups of water over night. When the soybean absorbed water and twice in size, place the soy bean with soaking water in a pot and bring it boil. Once it boiled, turn the heat down and simmer for 1 to 1.5 hours( you may need to add some water). Skim the foam from the top of the soup as necessary. I really enjoy all the combinations is great! This is such a great recipe. I love that I can get some healthy probiotics and fermented foods with such great flavor in this! Thanks for sharing. You are welcome Kristen 😀 and Thank you for the comment.